You're currently viewing product Style "B" Quarterboard in category Quarterboards. Style "B" quarterboard with scallop shells (or any other of our motifs) on each end. Letters, edge & motif can be finished in 23k gold leaf or metallic silver finish. Put your family name, property name or special title on your quarterboard. Please enter your name of choice when you add this item to your shopping cart. Shipping times are listed on the home page. 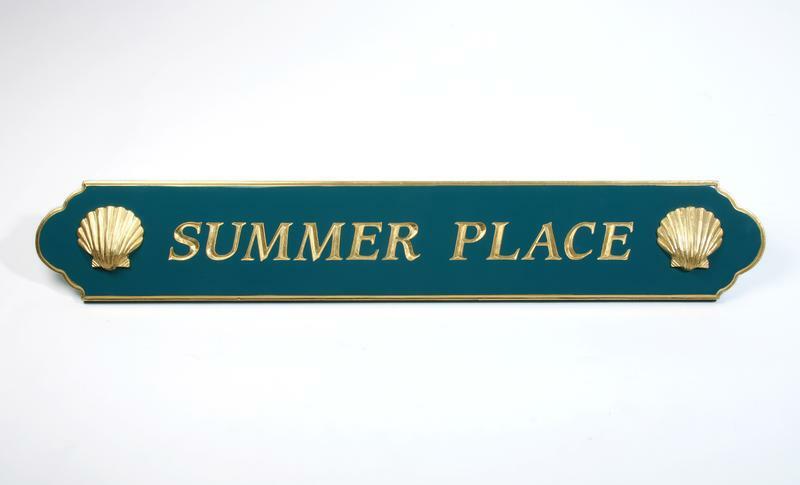 If you would like to see our motif selection, we have many examples on our house number signs. Please keep in mind some motifs may be too large or too small for certain sizes. If you have questions, feel free to give us a call or send an email.